Twelve Russians indicted, and one Russian spy? In the last week, twelve Russian intelligence officers were indicted for interfering in the 2016 presidential election. Robert Mueller now wants to give immunity to five witnesses. And, Manafort’s request to move his trial from a blue part of Virginia to a redder region was denied. But first, Josh Barro and Ken White discuss Maria Butina, a Russian gun rights activist who was friendly with a lot of Republicans and NRA members in Washington — in one particular case, a little too friendly. Butina was jailed this week, even before she was indicted. Josh and Ken discuss how that went down and how it might play into the Mueller investigation. 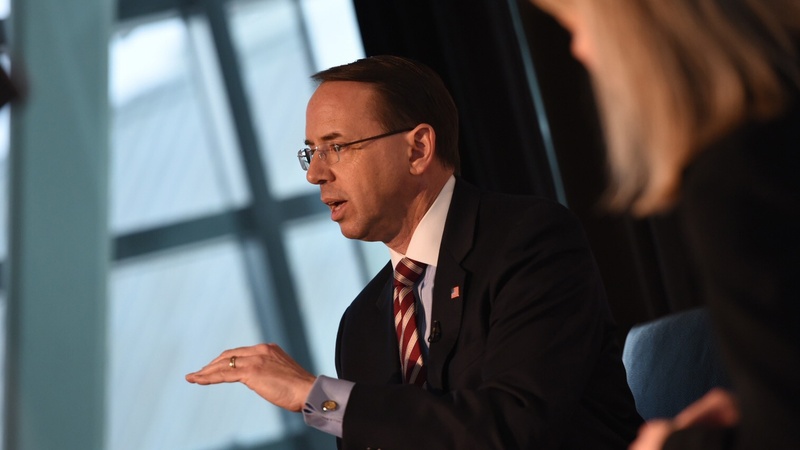 Deputy U.S. Attorney General Rod Rosenstein. Photo credit: Internet Education Foundation.